Food blogs should never be limited to only recipe sharing. That will typically be the focus around here, but when I’m lucky enough to find products, companies, small businesses, non profit groups and/or experiences that leave an overwhelmingly positive impression on me I want to come running back to share it with you all! I’m kidding, I’ll just be walking back quickly. I may be a fast walker, but I am in no way a runner nor do I ever plan to take up that ‘hobby’. The first small business I shared was a bit subtle and mentioned in my Simple Roasted Pork post. That small, veteran owned business is Farmers to Families and they sell single steer and single swine beef and pork. Y’all, it’s the best meat we’ve cooked in our home! It’s one animal that comes straight from the family farm, goes only to the local butcher for processing and then arrives frozen on your front porch. I love their simple business plan and attention to quality and good health! Treat yourself, check them out! The next small business I’m excited to share is J&K Restoration. When I say small business, I’m talking a great husband and wife team just getting started! These two are amazingly talented and worked together to design and build a five hook hallway sign and farmhouse bench for our entryway, easily my two favorite pieces in our whole house. We get compliments on them from everyone who walks through our front door. We found a little inspiration on Pinterest for the sign, but when it comes to the bench I literally said farmhouse style and provided the measurements. Why can I never find the exact things I see on Pinterest in stores? I love you Pinterest, but sometimes you are just a tease and I don’t always care for that. Custom means unique and I love the idea of having decor in my house that wasn’t purchased from a big name store that sold a hundred others just like it. Best reason, this team works with you on your initial idea and takes it to the next level from a design perspective! They are great on suggestions for material, colors and layout! Bonus – they check in with you along the way to make sure you’re on board with progress and like how everything is looking! Progress photos are exciting to get when you’re waiting on the final product! The hallway sign is made from reclaimed cedar. We initially planned to stain the wood to match other wall decor already in our entry way, but I’m so glad it was suggested to leave it with a natural finish instead. The wire basket was purchased from Kirklands and came filled with small glass vases. It was meant to be used as a table centerpiece, but worked perfectly attached to our hallway sign! 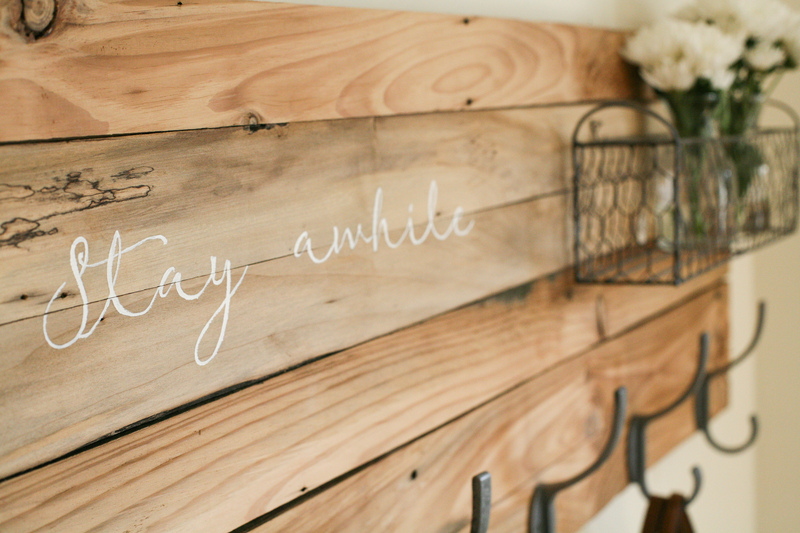 That and the words’ Stay Awhile’ stenciled and painted on the wood give it a cozy farmhouse feel! Like I said, for the bench I simply communicated farmhouse style and provided measurements. At this point, we already had the hallway sign so we knew it should compliment that. They did the rest for us – the actual design, color and idea to use a distress technique on the braces for a worn paint look. We aren’t all about brand new and “perfection”. I love the fact these items are hand made, hand painted and have character. The pillows and throw blanket are from Kirklands as well. I don’t know how I only discovered this store just over a year ago, but I have a feeling it’s been a good thing for my wallet that I didn’t know about it sooner 🙂 Hello, deals though! They send awesome coupons and I managed to get both of those pillows for $22. Okay by me! The coach purse was added, because I wanted to hang a bag on one of the hooks in that exact color and I already had it thanks to my parents being generous at Christmas! Eventually I may look for another bag that has more of a messenger feel and can have some faux flowers sticking out. That’s the fun part about these pieces – the look can be changed any time and made to fit the different seasons and holidays. I left our little tree on the bench from Christmas, because it just has a cozy winter feel to me and it seems we’re going to be in that season for a while longer! This entry was posted in DIY Projects, Outside the Kitchen and tagged Cedar, Custom, Distressed paint, DIY, Entryway decor, Farmhouse, Farmhouse bench, Farmhouse decor ideas, Hallway sign, Hand painted, Home decor, Reclaimed wood, Small business, Woodwork. Bookmark the permalink. Obsessed with your style! Everything on here is so cute! I love that entryway furniture! You did an amazing job! So sweet – thank you!! I’m loving the front page of your blog right now! I am all about homemade alternatives and finding awesome kitchen gadgets! !